I have recently bought a second hand exhaust off Ebay for the Nine. I got it for a bargain price and except for a minor mark on the inside (which I have managed to cover with the exhaust hanger) it is in excellent condition. The exhaust came with the hanger and a link pipe and was very simple to fit. 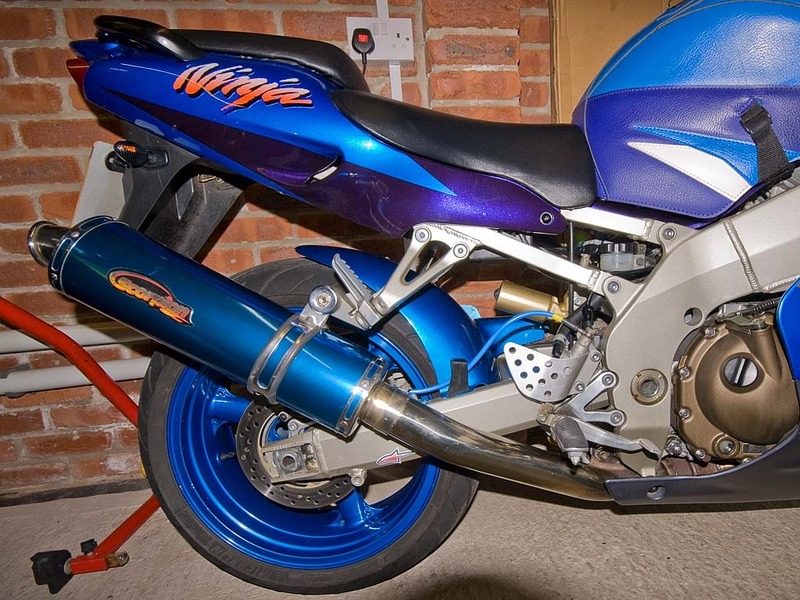 It is a round Scorpian exhaust in Blue, it doesn’t contain any baffles so is presumably a race pipe and not road legal. Although it doesn’t say so anywhere on it, the previous owners bike also passed the MOT with it on. I took the nine out for a 98 mile spin on Saturday over to Holmfirth and onto Saddleworth Moor. 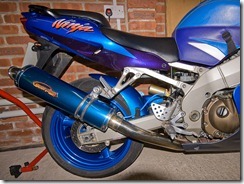 The exhaust has a nice deep throaty sound to it and is not over noisy, but could certainly not be described as quiet. The bike seemed to be happy with the exhaust, so I don’t think any further setup of the bike will be required. Although I will be giving the carbs a re-sync at some point. Nice bike. I like this bike. This is really awesome and its colour is great. Thanks for sharing.